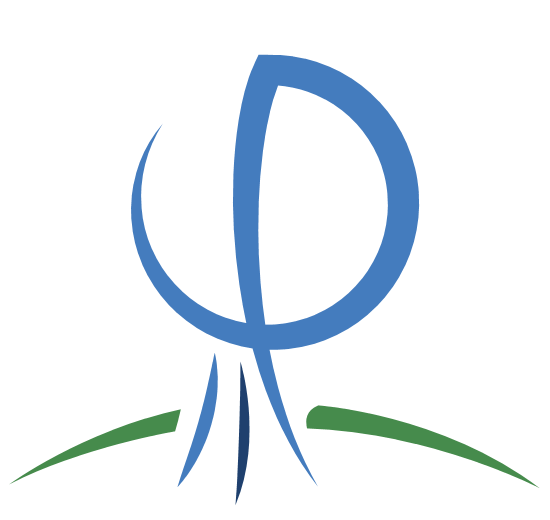 The idea of starting this blog is motivated in part by the initiative of the Open Commons of Phenomenology, which aims at offering a complete overview of the phenomenological movement, through the creation of a series of research blogs, whose activities encompass a wide range of topics and authors within the phenomenological movement. This idea is also partly motivated by an impression I had when I was a visiting scholar in the UK, few years ago. At that time, I remember a number of British students who addressed me, as they had a keen interest in Italian philosophy, which they intended to pursue. 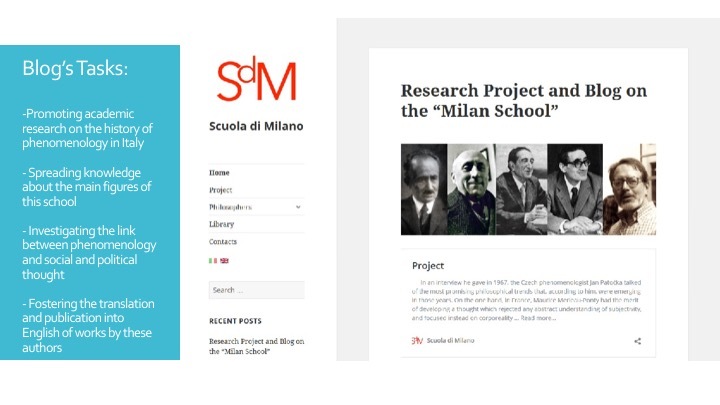 As a matter of fact, the idea that today foreign scholars have of Italian philosophy is severely limited to specific areas of research that, despite their utmost importance, fail to describe its complexity. 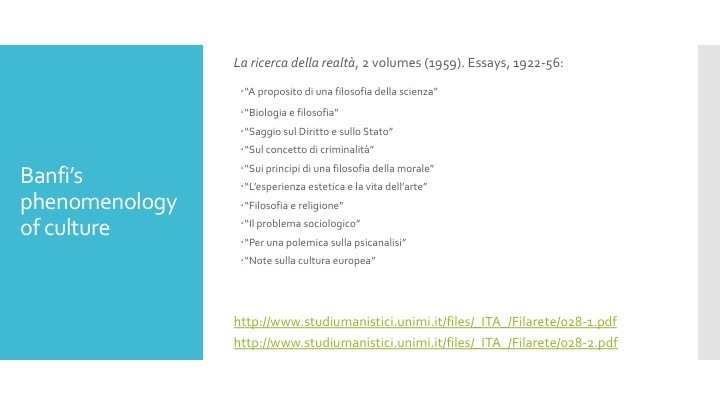 Workerism, Biopolitics, New Realism, Italian theory, are all fairly recent phenomena, which certainly deserve great attention, but that cannot (and neither intend to) give a complete overview of contemporary Italian philosophy. 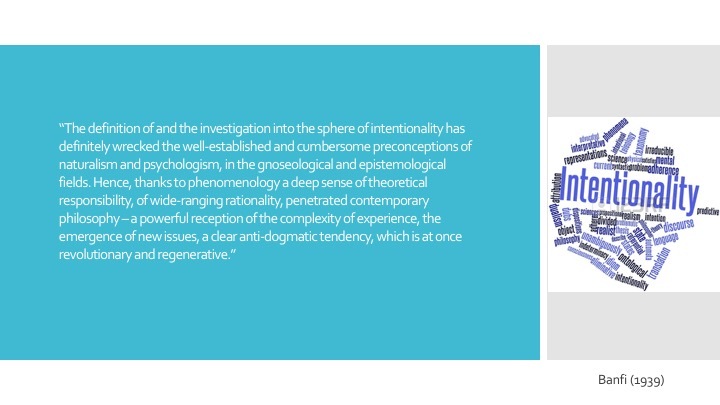 Something that lacks in all these reconstructions is indeed phenomenology. Despite this omission, though, it is well known the great impact that Husserl’s work had, especially from the 1920s until the end of the 1960s, on Italian culture and philosophy. The reception of phenomenology over these forty years constitutes a complex issue that cannot be displayed in its full length here, and that would rather require detailed analyses. Rather than retracing the manifold interpretations of Husserl’s works given by Italian thinkers (click here if you are looking for an excellent article on this topic), I would opt today for a much easier task. 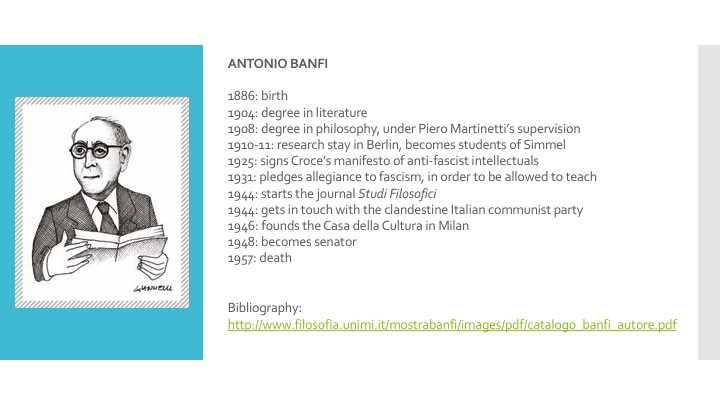 Basically, I will focus on the work of Antonio Banfi. 1) What are the main characteristics that determine the originality of Banfi’s thought with reference to phenomenology. 2) What is the meaning of his thought for today’s and tomorrow’s phenomenology. To answer the first question in a nutshell, we might recall what Jan Patočka said regarding Italian phenomenology, in an interview he gave in 1967. Talking of the most promising philosophical trends that, according to him, were emerging in those years, Patočka mentioned first Merleau-Ponty, who had for him the merit of fostering a phenomenological account of corporeality and of the embodied subject. Second, he recollected Antonio Banfi and Enzo Paci, who focused their investigations on history, and on the essentially historical character of human reason and experience. This element of history is indeed what distinguishes the rather different interpretations of phenomenology given by both Banfi and Paci. 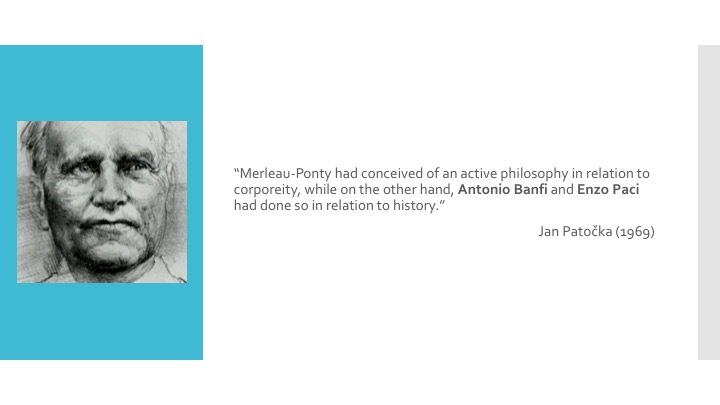 Banfi’s philosophical background sinks its roots in neo-Kantianism (especially in the Marburgh School of Cohen and Natorp, which justifies the strong emphasis on epistemology in his work) and also in neo-Hegelianism, even though he opposed the main idealistic trends that spread in Italy in early twentieth century (Croce, Gentile), and was rather influenced by Marx. 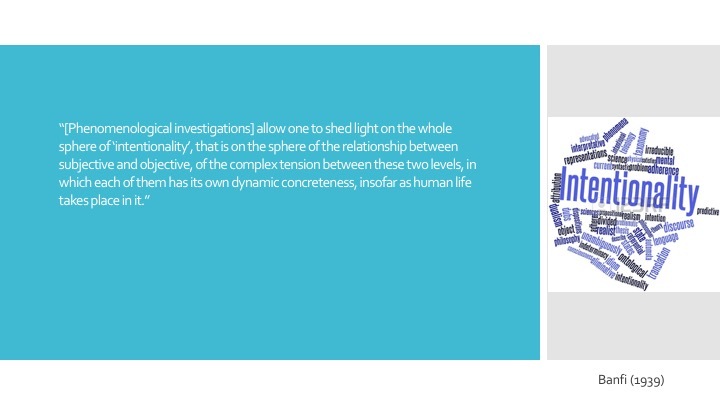 Although he probably started reading Husserl already in the 1910s, during a research stay in Berlin, Banfi’s real approach to phenomenology dates back to the 1920s: in 1923 he wrote two articles on Logical Investigations and on Ideas I, and a chapter of his 1926 book Principi di una teoria della ragione is devoted to phenomenology. Trying to summarize very briefly Banfi’s approach, one might say that it consists of a radical and pragmatic reinterpretation of the idea of intentionality. How can the idea of “intentionality” have an anti-dogmatic power, as suggested in the quote above? According to Banfi, Husserl, by sketching his theory of intentionality, could avoid the double reductionism that neo-Kantianism never truly overcame. On one hand, he avoided in fact the naturalistic and objectivist reduction and, on the other, the subjectivist and psychologist one. Reality, as we know and make experience of it, is therefore neither seen as the outcome of a spiritual process, whose action ends up determining it (as is for example in Gentile’s actualism), nor it results from a historical becoming that human mind can only passively acknowledge (as in bare historicism). Bridging subject and object on a new level, which is neither ideal nor material, intentional acts contribute to frame a new idea of rationality which for Banfi, contrary to what Husserl maintained, presents a fundamental dialectical character. This dialectics of reason, which emerges between subject and object in the process of intentional acts is for Banfi what determines authentic human experience. 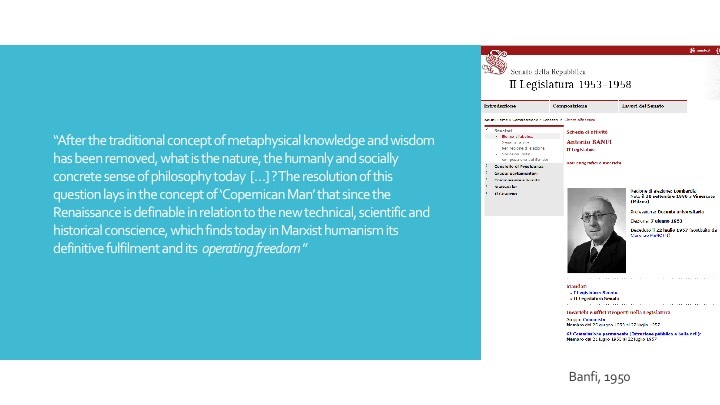 Commenting on these words, Enzo Paci praised Banfi’s far-seeing interpretation of the meaning and task of phenomenology, which consisted for him of a “method aimed at the unitary foundation of the various fields of knowledge”. 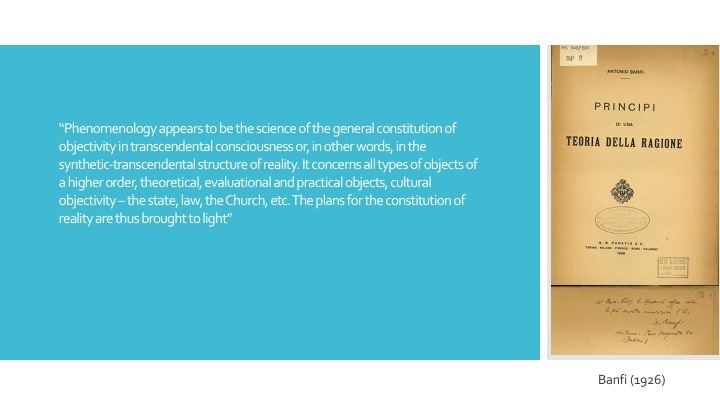 Although this definition can be already detected in Husserl’s early work, it is only after the publication of the second volume of the Ideas that the project of a far-reaching investigation of the various expressions of human culture takes hold in phenomenology, that is almost 30 years after Banfi first sketched his philosophy of culture. The main trait of this philosophy of culture, as Banfi describes it in the 1930 essay “Riflessione pragmatica e filosofia della cultura”, is the refusal of the idea that cultural forms can be established a priori, through a rational scheme that bypasses the thickness of human concrete experience and historical contingency (as for example happens in Croce’s dialectics). Far from this, the “pragmatic reflection” of man on culture only originates in its concrete and historical formation, which Banfi calls the “process of culture”, and only from this concrete formation one can mine the principle of its constitution. In other words, every cultural formation (art, ethics, law, religion) cannot be interpreted simply on the basis of its theoretical principles (aesthetic criteria, moral norms, positive laws, religious dogmas), but must be attained through a phenomenological process which aims at that substrate of notions, traditions and precepts that regulate that given sphere. A concrete phenomenology of art, for instance, should start analyzing the basic art practices, as they appear in everyday life, and later turn to the reflections that stem from these practices, moving towards a more and more precise definition of aesthetic principles, and the consequent emergence of artistic taste, until reaching a definition of beauty per se. This process is characterized by a never-ending dialectics; every time a new cultural form is institutionalized, and becomes thus part of a cultural heritage, the emergence of new practices and experiences break the equilibrium of this institution. Taking into account that this same scheme applies not only to art, but to every cultural sphere, the result is a complex cultural panorama. This panorama becomes the main subject of a long series of essays that Banfi devoted to aesthetics, philosophy or law, religion, natural sciences, and that he later collected in two volumes entitled La ricerca della realtà. Banfi’s insight into these topics must be certainly contextualized. These are years of reconstruction in Italy, after the end of WWII. Not only material, but also cultural and philosophical reconstruction. For Banfi, the only way to overcome the crisis of history consists of building history, and the only way to engender this reconstruction is reorganizing man’s cultural forces, i.e. the sources of human creativity. The emphasis on the anti-dogmatic character of intuition, which we encountered in his writings from the 1920s, seems here to disappear. Rather than a neat description of historical phenomena, a much more ideological vision of history ends up prevailing in Banfi’s writings. One of the most despicable examples of this tendency is probably his stance against the Hungarian revolution of 1956, which he accused on various occasions of being a merely bourgeois an counter-revolutionary phenomenon, and his praise for the Russian invasion. In conclusion, the second question I raised seems to leave unanswered. What is the meaning of Banfi’s thought, if there is any, for today’s philosophy and phenomenology? What remains of it, once it has been cleansed of all the ideological and illiberal sediments that so deeply compromised it? I think that a positive element still stems from it, if we look back at the early stage of his thinking, which is also the one that the interpreters have more often overlooked. By ranging from Banfi’s first phenomenological intuitions until his project of a philosophy of culture, one can still find valuable material for future philosophical investigations. This does not mean of course concealing the problematic aspects that Banfi’s later output entailed. It means understanding this aspects in a new way; as setbacks that do not diminish, but rather emphasize the historical relevance of this thinking.